This has been an interesting year to say the least. The people of the world have endured great struggle but our recent U.S. election promises hope for the new year! Recently I has the good fortune to have one of my Barack Obama photos published in TIME magazine's online Year in Review edition. I took a photo of Obama art done by Greg Boudreau, a talented young Seattle artist, www.project1042.com/contact.html. The art was standing (about 5 feet tall) in the Portland, Oregon, Obama headquarters. TIME selected my photo, along with several others for publication. 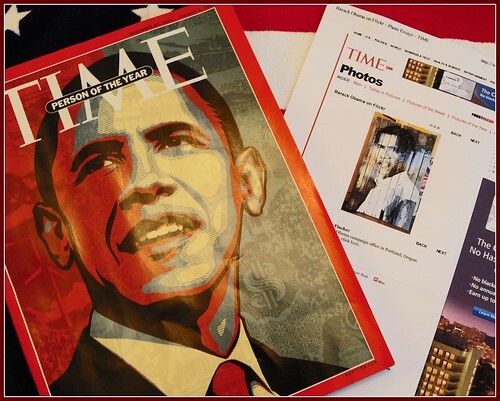 As you probably know, President-elect Obama is TIME's Person of the Year. I am one lucky person myself, to have my photo of him published in TIME online in 2008, the year we made history! Here's to a happy and Hope-filled New Year!